What are the dimensions? Does it have a kiln sitter? 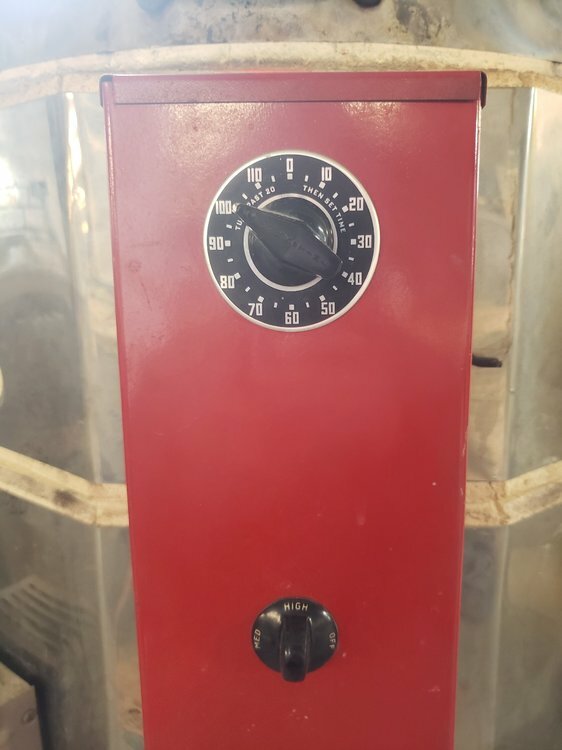 What type of control knobs/switches does it have? Are you sure the label may be typo -it could be the Rare Jonney be GOOD model-later a little song was done about it? Edited March 24 by Mark C.
Its a 42 amp-your photo of the plate is cut off-how about a full plate photo? 9.6 Kw probably gets you a strong cone 6 in a 3 cu ft single wall kiln and very likely no better than cone 6-8 in a four to five cu ft. Single wall kiln. Once you get into the four and five cu ft kilns you really need more like 11kw for a solid cone ten machine. 11 kw in a seven cu ft kiln struggles to reach cone six when the elements are worn. you have given us a photo of the kiln sitter with timer. are you at all familiar with this shut off device? it really has nothing to do with the kiln itself, it just turns it off. the knobs turn the temperature up. there are manuals available on kiln use. we have had several recent threads about kiln sitters. you mention having cones and maybe are mistaking a cone for incense. can you elaborate? cones do look a little like cone shaped incense. the meaning of the numbers on the cones will become clear a little later in this discussion. a photo of the interior showing the coils of wire, (elements) and the bricks themselves will be most helpful. neil is a kiln professional and can be of great help in providing advice on whether the kiln is potentially a good one or if it would be costly to fix it if there is anything wrong with it as seen in the photos. look at the elements and see if they are standing straight up in their grooves or are they leaning over on each other. you just might have the beginnings of a good teaching experience. edit it would help to know where in the world you are. edit if you enter Good Kiln manufacturer in a new tab, you can read some info posted here several years ago as well as from another site re a possible lead . 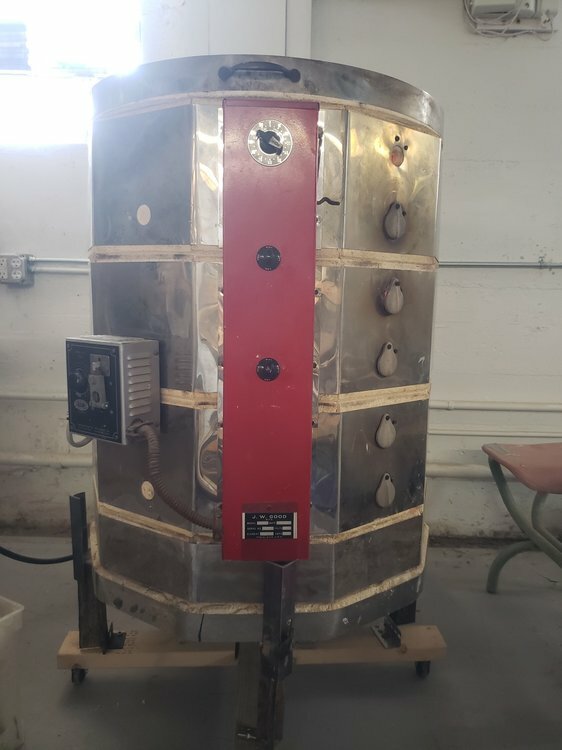 Wish I could offer more help - I have a JW Good, that was given to me several years ago, and was never able to locate any info on the﻿ kiln itself. Mine﻿﻿﻿﻿﻿ is missing t﻿he plate on the main portion, ﻿so not even sure w﻿hat the rated w﻿atts/amp﻿s is.﻿. If you have a need to know more precisely and can measure the resistance of the machine the approximate wattage can be calculated easily. From there typical operating voltage and suggested wire size can also be worked out. 9.6Kw will get you cone 10 in a 4.5 cubic foot kiln just fine. My experience would say use it as a strong 6-8 but yes a 4.5 cu ft kiln could go to cone ten on 9 kw. The majority of machines jump to the eleven KW range as soon they get much much bigger than 5 cu ft. And I have personally watched many 11kw kilns unable to make cone six in 14: hours after their elements have degraded measurably 10-15% which means there power has decreased to just above 10 kw. I would suggest he stick with cone 6-8 use. I'm having trouble getting the other photos to upload here, it says they're too big even though they should be the same size as the ones I already uploaded. 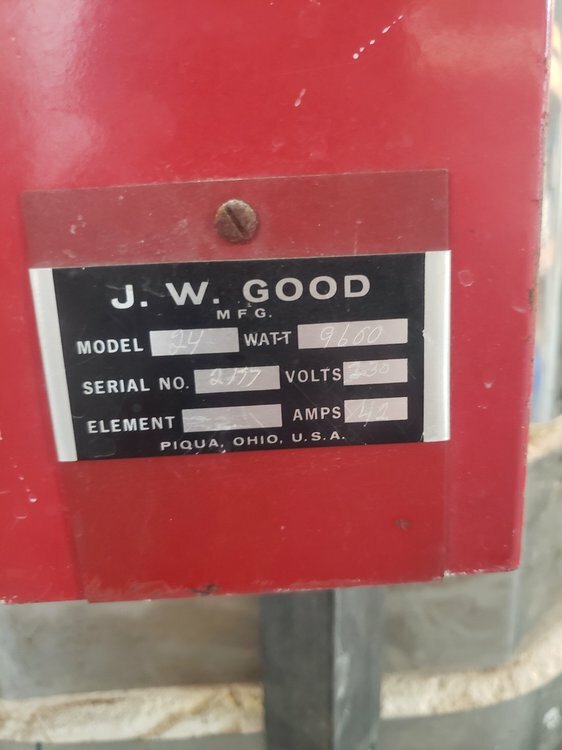 Sorry about the plate being cutoff, it's the only angle you could read all the engravings from, the only things cut off are the "j" in "J. W. Good", then "model", "serial no"., and "element" which was left blank. The top section is not separate. There's a knob at the top that is marked 0-115, then two knobs that are low-med-high. It is in working order. The owner of the makers space made cookies in it to test it out(I wasn't there, I would never do that, doesn't seem safe with a used kiln especially). I'm actually most confused by that top knob but it won't let me upload any of my pics of it or of the whole kiln. Also, the highest cone that came with it was a 6, but it was broken. The comment about the incense was that there was indeed a pack of cone incense in the same box(I know the difference and they had a sent) . A bit of a bad joke, I guess, but the point was that it made me doubt that those cones were ever used for that kiln and may not give a good reference for measure. But from what i'm seeing here, it probably is a cone 6. Here is a way if you are using windows. Put your pictures in one place, select them (Holding down the control key allows you to select all of them) and then right click. Pick send to, then mail recipient from the popup menu that will appear. Select a size under 0.98 MB when the attachment popup displays and attach to an email addressed to yourself. Send these to yourself or simply select them in the email and move them to a folder you can find later and cancel the email once you have saved these reduced size photos. I believe the posting limit here is about 0.98 MB so all together strive for your photos totaling maybe 950KB (0.95MB) so just to provide some safe space for misc. file overhead. You should be able to insert all the photos as long as they total less than the 0.98 MB, or our 950KB limit. I am going to guess this is about 21x27 Single wall kiln. Looks relatively nice, inside is the critical part. At 9600 watts I would guess you might make it to cone ten and it is provbably rated as such. 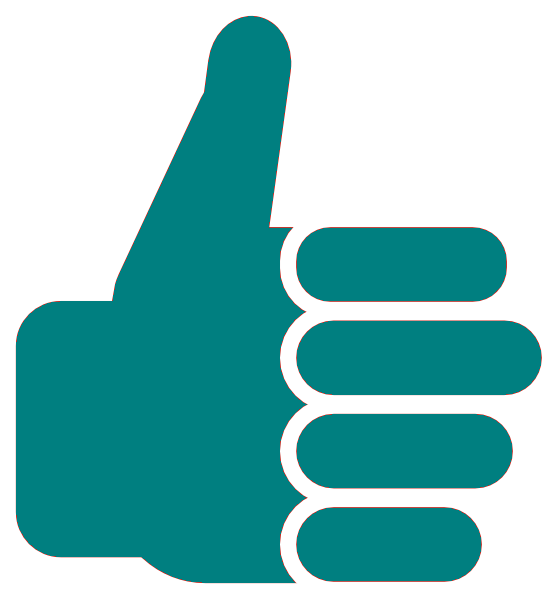 Rating and doing are quite different though so hopefully you enjoy many years at cone six with it. My opinion is still a practical strong six kiln. The electrical nameplate is from the days of nominal voltage at 115. / 230. Today we generally calculate at 240 volts so this should end up drawing just a touch over 40 amps at full load. All Skutt, L&L, etc. 4.5 cubic foot kilns are rated to cone 10, even at 208V 1P 8.3Kw, but yes, only firing to cone 6 will definitely give you longer element life. What is the interior width? Based on the shape in the photo, it appears to be an 8 sided kiln, which are usually about 18 inches across.